If you want to offer a percentage or set dollar amount off of any and all options in your Registration, you can do so by setting up coupon codes. Coupon codes are pretty flexible, but at the moment cannot be used to automatically give people a discount when they enter above a certain quantity during checkout. 1. By bundling the package into one ticket/price. Have each Registration Type reflect the different options available. The first Registration Type will be Individual registration, where supporters can purchase individual tickets in multiple. All following Registration Types will be bundles of tickets, such as buying a Table of Six. The advantage of this method is it's straightforward to your supporters, and a bit easier to set up. The downside is you likely cannot opt to collect Individual Participant details, only the Registrant (buyer) details, and if you pull a report of all attendees, bundles or tables will count as one registration, the same as an individual registration, so it's not as easy to get the full participant count at a glance. If that is important to you, you can use the method below. 2. 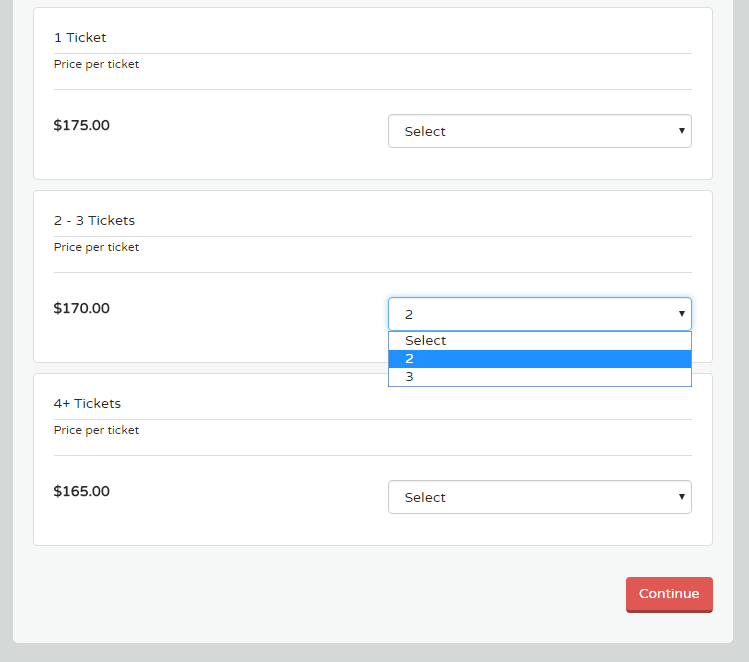 By keeping tickets separate and offering multiple price points. For this one, we'll use the following example. The first Registration Type is called "1 Ticket" priced at $175 and set to min. quantity = 1 and max quantity = 1. The second Registration Type is called "2+ Tickets" at $170 with a min. quantity = 2 and a max quantity = 3. The third Registration Type is called "4+ Tickets" at $165 with a min. quantity = 4 and max. quantity = any other tickets at that price. 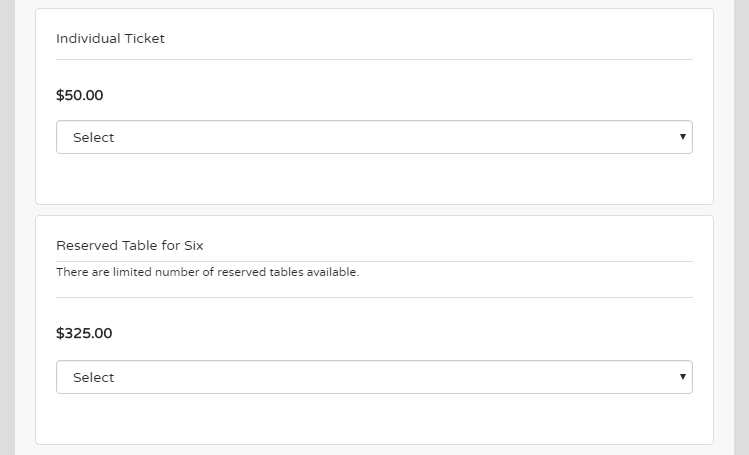 You can enter the text "Price listed is per ticket" in the description area of each of these registration types to make it clear to your supporters that the price is per ticket rather than the full bundle. When selecting each, they will be restricted to purchasing only the quantity that is allowed at that price tier. The advantage of this method is it allows you to more easily get attendee counts and you can also opt to collect Individual Participant Details of every single ticket holder. It will require a bit more setup than the above method. Ultimately, the style you choose depends on how you prefer for the information to display to your supporters as well as how you need to be able to report or pull that information on your end for this campaign. If you have any questions about how to best set this up, don't hesitate to reach out to your Success Manager!